SoftPlanet makes it possible for everyone to get free MP3 Rocket download directly from our servers. There is no registration needed for downloading. 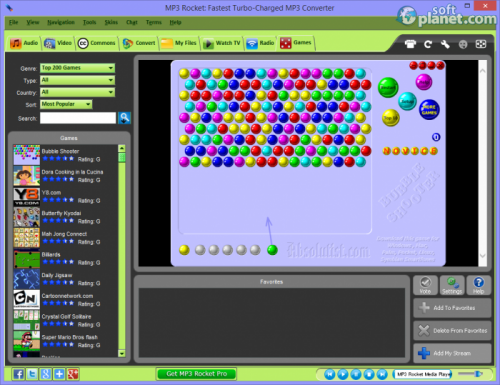 MP3 Rocket 7.3 is an application which can download and convert videos and music files from the web for free. You can use the built-in search engine or just copy-paste the link into the program's search window. Beside that users can also use this app to watch many live streaming TC channels and listen hundreds of online radio stations. Of course all that comes for free like the built-in media player. 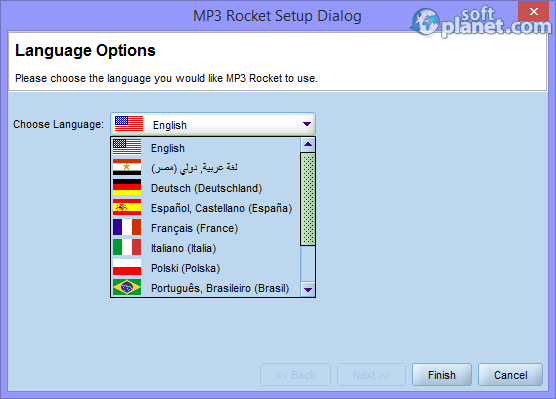 MP3 Rocket 7.3 is compatible with any mobile device and can be installed in more than 10 languages. The program works with Windows 2000, XP, 7, 8 and with Mac OS. All the media files, which the program finds, can be stored on your PC as audio files and their format can be MP3, M4A, AAC, AIFF, FLAC, WAV or WMA. Along with that the ID3 tag information is also filled in. A nice addition to the program is the games tab, which has more than 200 popular games from all kinds of genres. On start-up MP3 Rocket loads all its current settings. If you do not like its look there is an option to change the skin. Like any other Windows-based program this one has its menus on top, followed by the feature tabs. Each one of them has its own settings and can be active only if you use it. Probably the most attractive one besides the media downloader and converter is the live chat. It is very easy to use MP3 Rocket. You can use the program to search for your desired media file or if you already have the link – you can paste it in the converter field and press the download button. By clicking on the Radio tab you will only have to choose the station you want to listen to from the list on the right and the built-in player will play it for you. MP3 Rocket 7.3 is an all-in-one type of a program. Probably it is the only one with so many and various features combined in one application. All these reasons may be enough to convince you to try this product besides the fact that it is absolutely free. Our security scan shows that MP3 Rocket is clean from viruses. The current version of MP3 Rocket has been scanned by our system, which contains 46 different anti-virus algorithms. That ensures that MP3 Rocket 7.3 is 100% safe for your computer.